If you are interested in exploring one of Europe's northernmost countries, you should definitely choose Norway as your holiday destination with Oslo as your starting point for a trip by rental car. Norway's capital city, with a population of over 600,000, is located on the southern edge of the country and is always worth a visit. And this is exactly where we start our virtual journey, because here the infrastructure is perfect. Car RentalCheck helps you to compare car rental prices in Oslo on the comparison portal and secure the best deal for you by making an online booking. If you choose Norway and want to rent a car, start in Oslo. There are several reasons for this. Firstly, Oslo has two major airports with excellent transport connections. The main airport is Oslo Gardermoen (OSL). The airport Oslo-Torp TRF is considerably further away from Oslo than Gardermoen Airport. Secondly, you have the chance to arrive in peace and quiet in a country that is completely foreign to you. You get to know and appreciate the people, customs and traditions in the middle of a vibrant metropolis, you can pick up your rental car at the airport in peace and quiet, because the rental stations have a huge fleet of vehicles open for a very long time. Let us begin with a fact that not everyone is aware of: Norway is in Europe, but not part of the EU. Payment is made with Norwegian kroner (NOK). When you travel to Norway, you cross the EU's external border. This means that only the things you need for your holiday may be imported duty-free. The total value of belongings may not exceed NOK 6,000. Otherwise you must go to the customs declaration. In addition, you are only allowed to carry 200 cigarettes. You must also be careful when bringing along alcohol or food. What do drivers in Norway have to pay attention to? You may need a translation of your driver's license when renting a rental car. Furthermore, we would like to point out that entry to the centres of some cities is subject to a fee. In Oslo you pay 31 NOK for a rental car with a maximum of 3.5 tons. If you rent a car, it is best to inquire in advance whether your rental car is equipped with a transmitter (AutoPASS brikke). So that we automatically record and bill the toll. Alternatively, you will have to make the "payment for visitors", a pre-payment of the toll via a credit card. There are also toll roads outside the cities. There is no general obligation for vignettes, as is common in Austria, Switzerland or other countries. In Norway, as in Europe, the right-hand drive requirement applies. In addition, even if you are out and about in good weather and during the day, the light must be switched on all day long. If you leave the car, you must wear a safety vest. Driving under the influence of alcohol is a taboo which is strictly punished from 0.2 per mille upwards. Attention, if you are on the road with studded tyres in winter: you will have to pay extra fees. Parking in Oslo is generally very expensive. Similar to our cities, there are many public parking lots or multi-storey car parks where you pay for the time you used the car park. You can pay the invoice with various credit cards. The alternative is a mobile app called Bil i Oslo. Follow the parking rules and keep the distance to zebra crossing, crossroads or cycle paths. Otherwise there are drastic penalties, which the car rental company will certainly not take over for you. What insurance do I need for my Oslo car rental? No matter where you rent a vehicle. A "fully comprehensive insurance without a deductible" is recommended, because it represents the carefree all-round package. The liability coverage should also be high enough. We consider 7.5 million euros in total damage to be appropriate. Do I have to pay a deposit in Oslo? Yes, however, this has nothing to do with Oslo in general, but rather with the fact that every car rental company raises a deposit that is based on the value of the vehicle. After all, in the event of a claim, you want to have at least one available sum that you can access. If the car is returned without damage, you will be refunded the deposit immediately. When is it worthwhile to rent a car in Oslo? Oslo is always worth a visit. Of course, you should bear in mind that the winter months can be freezing cold here and that you are exposed to polar winter in the northern parts of Norway. The warm seasons are certainly more pleasant for city trips. Those who like to see nature will find the most beautiful time in late spring. If you want to experience midsummer with full daylight, you have to visit the north in summer. In summary: The ideal travel time for Norway is from May to September. Where to go with the rental car? 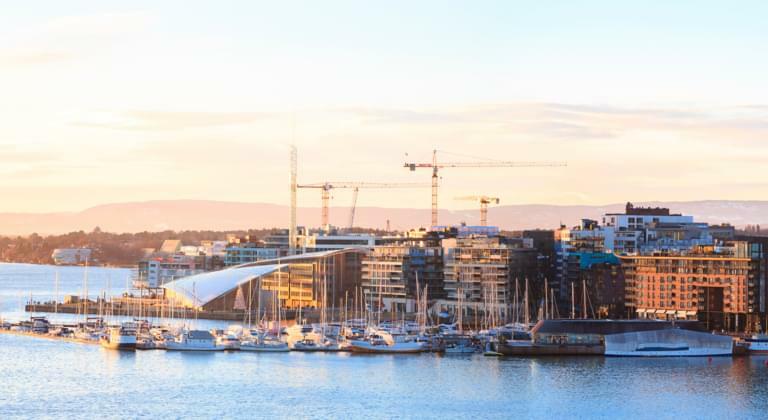 Oslo is not only the capital of Norway but also the most populous city in the country. Because it is located in a climatologically favourable location, it invites you to extensive exploration tours. And this is just an excerpt from the sightseeings, of which there are many others. When you rent a car in Oslo, it's not just the advantage of getting from one destination to another quickly. The country itself is stunningly beautiful and outside of Oslo the connections are much worse. If you want to travel further distances, which is no problem thanks to the car, we strongly recommend day trips to Norway's most beautiful fjords. They were formed during the recent ice age and reach far inland. Deeply excavated cuts into massive mountain ranges create a wildly romantic environment that is nowhere more beautiful than in Norway. The Oslofjord is one of the most beautiful. Or the Sognefjord, which is the longest and reaches a depth of up to 1,308 metres. Nature lovers will definitely get their money's worth. As you can see: Norway has something for everyone. Start your holiday in Oslo, take a rental car and explore the capital and the surrounding area and the whole country. Take your time and enjoy what is offered to you here. You won't regret it.